We want to thank everyone who attended the last Des Moines HUG. It's always great to share inbound marketing practices with our favorite people in the Des Moines area. 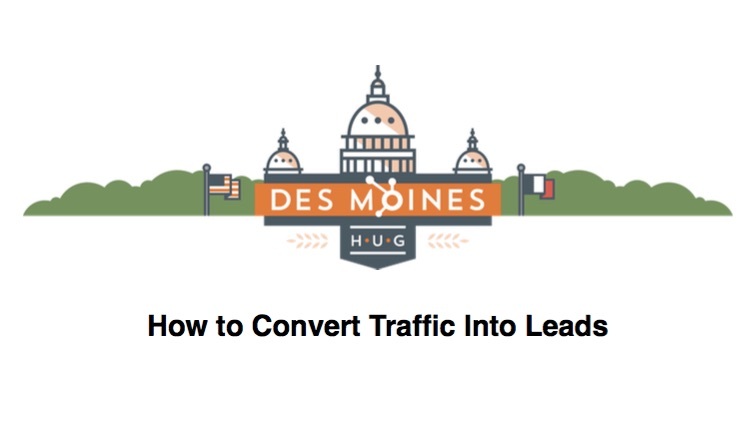 Brian and I had a great time presenting How to Convert Traffic Into Leads and we wanted to share the slides with you. Why it’s important to start with a plan by discovering your personas and mapping out your content to the buyer's journey. How to use CTAs, forms, landing pages, and thank-you pages to build the conversion path (including some best practices for each tool). How to track, edit, and repeat using campaigns and by asking critical questions. Enjoy the slide show. We hope to see you again at the next HUG meeting! "Q&A Panel & Open Discussion"
Join us for the next Des Moines HUG meeting in November. To wrap up the end of 2015, we'll be having a Q&A Panel with open discussion. Bring any questions you have, problems you've been experiencing, help you need with your inbound marketing or questions about new features HubSpot rolled out at INBOUND this year. © 2019 HubSpot. All Rights Reserved.